Neurofibromatosis - body, causes, What Is Neurofibromatosis?, What Causes Neurofibromatosis? The most common form, called neurofibromatosis type 1 or NF-1, mainly affects nerves in the skin, producing soft nodules or bumps. Neurofibromatosis type 2 (NF-2) is a very rare disorder that affects the auditory nerves responsible for hearing and balance. Both types are caused by defective genes * . Neurofibromatosis also is called von Recklinghausen's disease, after the German physician Friedrich von Recklinghausen (1833—1910), who described it in 1882. The tumors he noted, called neurofibromas (noor-o-fy-BRO-mas), arise from the cells that make up the covering sheaths of the nerves. Although many people who have neurofibromatosis inherited it from one of their parents, between 30 and 50 percent developed it sponta-neously from a mutation (change) in their genes before birth. Genes produce proteins that determine a person's body physical and metabolic characteristics, everything from the color of a person's hair to how fast a person burns fat. Scientists recently have discovered that the neurofibromatosis genes, when normal, produce proteins that suppress tumors. This suggests that when the genes are defective, they may fail to produce enough of these proteins, thus allowing the growth of tumors. Further research is needed to confirm this theory, however. 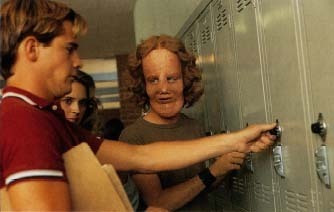 Actor Eric Stolz portrays a high school student with neurofibromatosis in the film Mask. © 1994 Universal City, Photofest. have NF-1 until it is diagnosed during a routine physical exam. The disease is usually mild. The diagnosis of neurofibromatosis is made mainly by noting its out-ward signs. Internal viewing techniques, such as MRI (magnetic resonance imaging), are sometimes needed as well. Treatment is then based upon controlling symptoms. Various cancer treatments may be used in the rare instances that tumors become malignant. * Recent progress in biomedical research into the causes of neurofibromatosis has raised hopes that someday there will be treatment to slow or halt the growth of its tumors. Genetic tests and counseling are available for people with neuro-fibromatosis. It can help them learn more about their condition or that of a family member, and can assist in making decisions about having children of their own. Neurofibromatosis has long been associated with the "Elephant Man." This was a name given to the Englishman Joseph Carey Merrick (1862-1890), who was exhibited in public as a medical freak because of his grotesque disfigurements. Merrick was, until recently, thought to have had a severe form of neurofibromatosis, but accumulating evidence now indicates that he was suffering from a much rarer disease called Proteus syndrome. Nonetheless, public awareness of neurofibromatosis was greatly increased afterthe production of a play in 1979 and a film in 1980 on the life of Merrick. * malignant (ma-LIG-nant) refers to cancerous tumors that spread to other places in the body, resulting in a condition that can lead to death. the movie Mask was about a boy named Rocky Dennis who had craniodiaphyseal dysplasia (or lionitis). I too have NF so does my oldest son and my youngest son.. I am a single mom wishing I could just get rid of it for them as well as myself. My youngest son is 12 and in a body brace because he has Scoliosis and goes to the Shriners Hospital in Greenville SC..I wish i could take his place and be the one to have the surgery but It's the Lords will .Kep us in your prayers.. Please update your article. The Rocky Dennis character DID NOT HAVE NEUROFIBROMATOSIS. He had craniodiaphyseal dysplasia. This is a completely different condition and it is nicely described by Rocky in the movie. My patients with NF find your website and are panicked by it. You've done a nice job of addressing the misinformation about Joseph Merrick, please continue this tradition by correcting the misstatement about the Rocky Dennis character.